CalFire on Tuesday reported that the West Fire in Alpine has been fully contained, but fire crews will continue to be assigned for patrol purposes. Start date: July 6, 2018 11:15 a.m. Injuries: One firefighter suffered minor burns to his face. Road closures: All road closures were lifted as of Sunday afternoon. 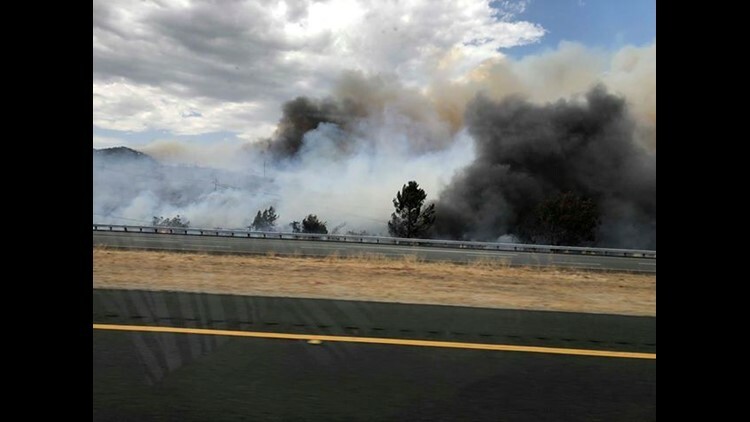 ALPINE (NEWS 8) - The Latest on the fast-moving brush fire (West Fire) alongside Interstate 8 near Viejas Casino in Alpine. 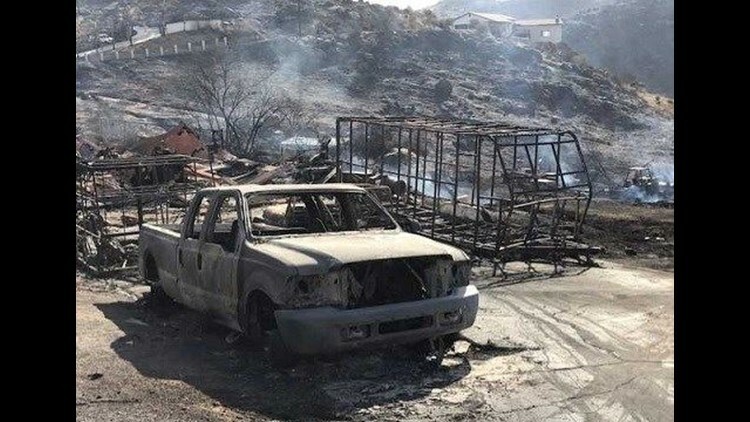 TUESDAY - 9:15 p.m. - The charred burn area of an Alpine-area wildfire that gutted three dozen homes and 29 other structures last week was fully contained Tuesday as the county Board of Supervisors voted to extend a declaration of emergency in the aftermath of the 504-acre conflagration. 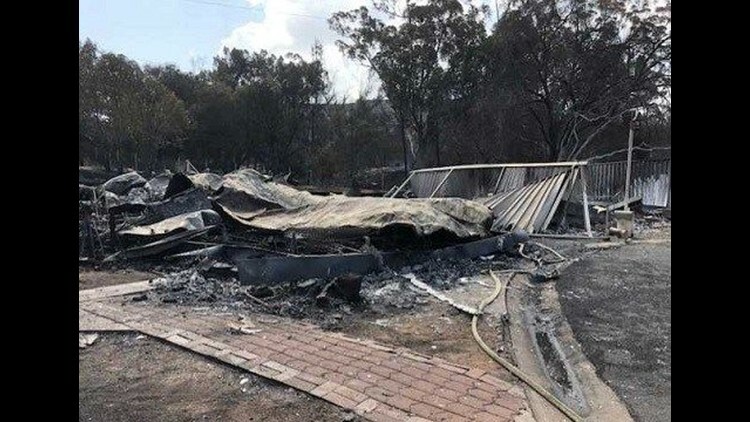 On Friday, Chopper 8 footage showed large tile-roofed homes residential trailers and small outbuildings engulfed in fire. Dozens of structures appeared to have been gutted. 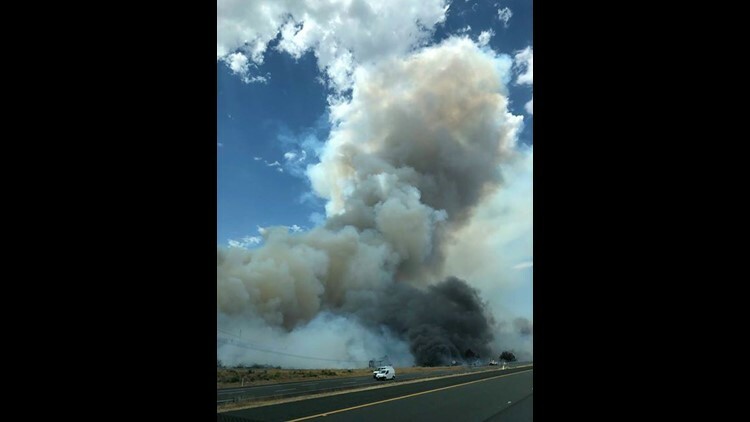 Crews from various local agencies attacked the blaze on the ground and aboard water- and retardant-dropping aircraft while braving midday heat measured by the National Weather Service at 108 degrees. Evacuation orders had affected communities including Suncrest Vista Lane, Highlands View Road, Manzanita View, Olive View, Scenic View Road, Pine View, Viejas View Place, Sage View, Oak View Road, Verde View Road, Calle Caleta Viejas and Via La Mancha.Gov. Jerry Brown declared a state of emergency for the area late Friday. 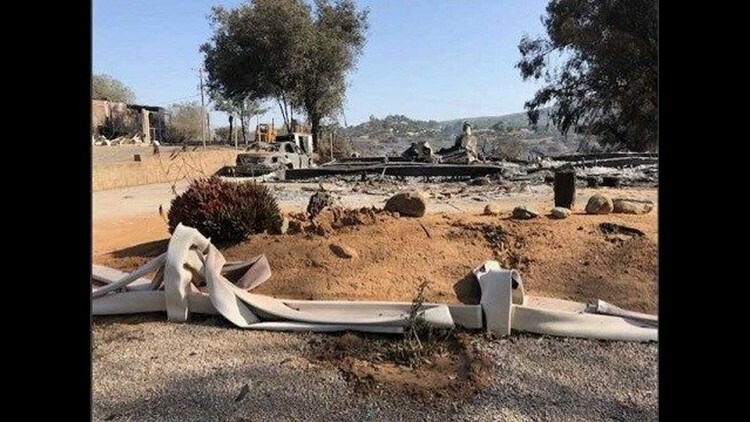 The gubernatorial decree cleared the way for the state to provide immediate disaster assistance to the county, allows for expedited unemployment benefits for anyone who lost a job due to the blaze and waives fees for replacement of documents -- including birth certificates, marriage licenses and vehicle titles -- lost to the flames. 4:38 p.m. - No official word on the number of homes lost in the West Fire, 400 acres burned, 5% contained. An Alpine Firefighter was injured fighting the fire. He suffered slight burns to the side of his face. He remains hospitalized but will be released tomorrow. 2:34 PM - SDG&E is reporting 3,000 people are without power due to outages related to the West Fire in Alpine. Facebook video from News 8 reporter, Monique Griego, on scene of firefighters putting out a house fire. Red Cross is setting up overnight evacuation site at Los Coches Creek Middle School for evacuees address is 9669 Dunbar Lane, El Cajon. Temporary evacuation site at Viejas Casino parking lot. 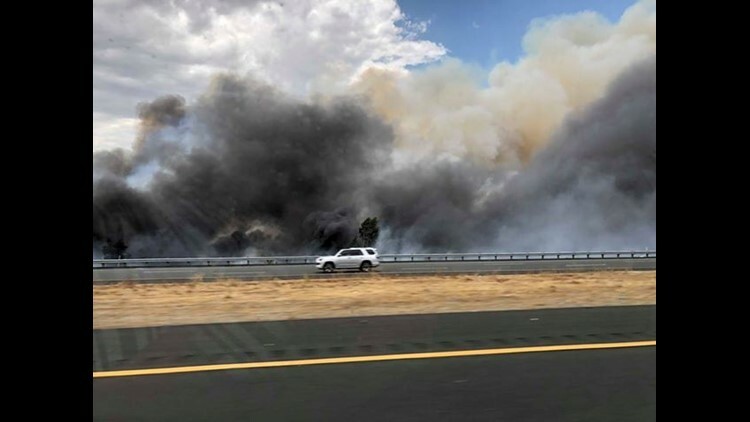 1:05 PM - A fast-moving brush fire broke out alongside Interstate 8 near Viejas Casino amid scorching summer temperatures today, threatening numerous rural homes and sending a column of thick smoke over the East County. 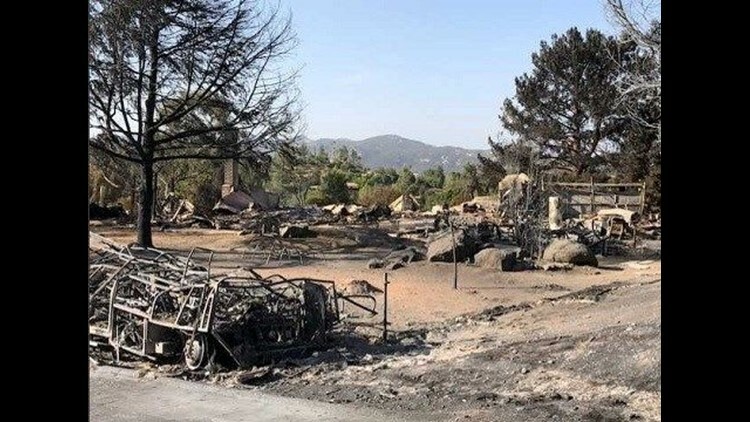 The blaze erupted for unknown reasons about 11:15 a.m. off West Willows Road in Alpine, according to Cleveland National Forest officials. Within about 30 minutes, the flames had spread over roughly 15 acres and were an immediate threat to structures, according to the federal agency. As of early afternoon, the flames had engulfed "multiple" mobile homes. 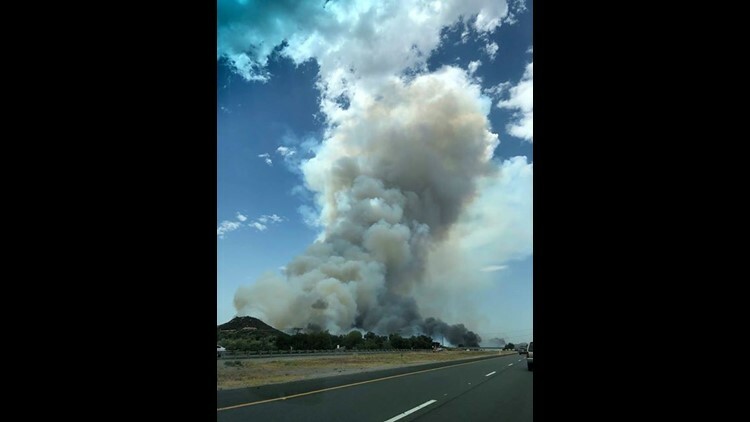 Crews from various local agencies were attacking the blaze on the ground and aboard firefighting aircraft in midday heat measured by the National Weather Service at 108 degrees. 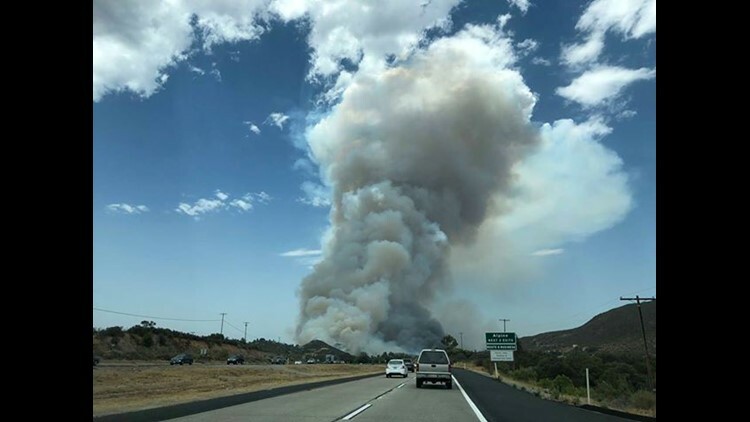 San Diego County Sheriff's is reporting the need for IMMEDIATE evacuations at Highland Mobile Home Park and the area immediately behind the Albertson’s located at 2955 Alpine Blvd. Individuals can evacuate to Viejas Casino (5000 Willows Road).